There are may signs that confirm the growth in the pleasure boating sector, especially the part associated with the production of larger boats. It only takes a look round Versilia, which historically represents one of the main Italian productive centres, to confirm this fact. All the boatyards in the area are working at maximum capacity in order to handle the numerous requests that arrive from all over the world. We are deliberately referring to Versilia and not only Viareggio, because also in the area of Massa Carrara a series of important operators with the intention of becoming leaders in the international market in the megayacht sector are developing and organising themselves in terms of means and structure. 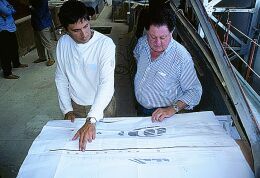 The Picchiotti Yachts boatyard is emblematic in this sense, noble in its name and ambitious in its plans, as can be understood from this interview that took place in the structure in which a new 27 metres was being finished. Our interviewees were Filippo Picchiotti and Fabrizio Santucci, respectively chairman and managing director of the Tuscany firm, together with the sales director, Andrea Battaglia. 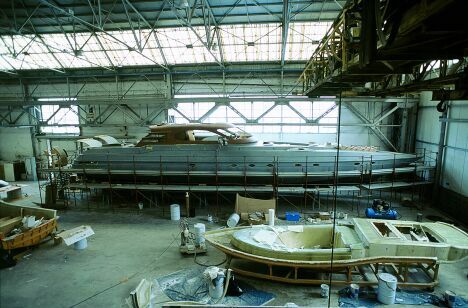 Yours is an historic name in pleasure boating, but Picchiotti Yachts is in fact a recently founded boatyard. I'd like to know how you are organised and structured. Picchiotti Yachts was founded in November last year but, as you rightly say, our activity in the pleasure boat sector goes back a long time. Right from the start, we planned to give our boatyard a suitable structure for the production of large boats, and for this reason we immediately gave the go-ahead for the construction of a production area, currently in the completion stage, in a new industrial area of Carrara. The boatyard occupies 7,000 sq.m. of which 3,000 are covered, equipped in all respects for the working and handling of very large hulls and, obviously, complete with an office area. On the other hand, we will retain our sales site in Viareggio for a question of prestige, given that it's an internationally renowned boating centre, especially when referring to the construction of superyachts. Do you also have a base at the sea? We are about to become members of a consortium, together with a group of other boatyards such as Fipa and Falcon which, as part of the restructuring of the port of Carrara, will manage the part devoted to pleasure boating. Then, we'll have boat mooring places and also the possibility of launching and hauling our boats at a minimum distance with respect to the productive site, thereby simplifying logistics and limiting transport costs. How many boats do you plan to produce every year? As to numbers, for the productivity, a lot depends on the dimensions of the hulls; however, at full capacity I think around eight units. Will you construct hulls in plastic reinforced by fibreglass, or are you thinking of using other materials, and then, what type of boats will you construct? We will certainly start by constructing boats in plastic reinforced by fibreglass, but we will be able to meet every specific request of the boat owner, both with regards to the material to use and to the type of boats built. We are currently working on open boats of 72 and 85 feet, then we will also produce fly boats, of 22, 24 and 28 metres. How will you be organised from a commercial point of view? Without doubt, our target clientele will be of a very high level and this obliges us to create a sales network, but also an appropriate after-sales service. Anyone who spends so much money on a boat has the right to be assisted in everything and for everything, both pre and post sale. It will be one of our "pluses", an organisation structure really able to follow the customer, that makes the customer feel protected, almost one of us. I'll give you the example of the American market which is without doubt one of the most important, the one where we count on selling a good part of our future production. We have already established a sales network there, based on three strategically positioned sites: one in the New York area, one in Miami, both already fully operational, and one in California. With regards to our office in Miami, we have provided it with a large warehouse where we will be able to store all the material necessary for ordinary and extraordinary maintenance of our hulls. 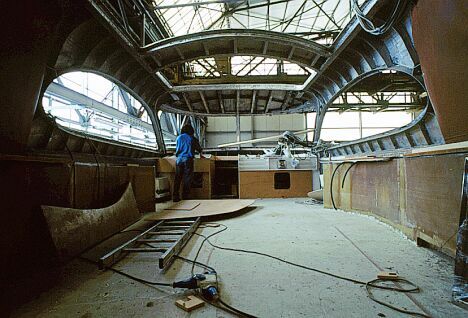 In this way, we will be able to guarantee the immediate availability of spare parts and this, in our opinion, is an element of essential importance in establishing a foreign boatyard like ours in a market like the North American one, which is so sensitive to these problems. In addition, we have the logistics support of a very important American dealer, Total Marine, the owner of as many as four marinas, factory buildings for garaging, highly qualified labour, etc. This company, and other brokers in the USA, have shown great interest in Picchiotti Yachts, drawn by the pedigree of our name, also very well known across the ocean, but certainly also convinced by our plans and by the quality of our boats. We have chosen Andrea Battaglia to be the head of our sales division, who has the benefit of experience gained previously in the Tecnomarine boatyard; he's making a very positive contribution to our development, achieving, as in the United States, a streamlined but well organised network, with offices situated in key points where the luxury boat market is really developing. What will be the "leit motif" characterising your production? Exactly, of domotica applied to boats. As a fundamental element we will have top-class plant engineering in terms of quality, which will also include new lighting systems, run by a computer but also controllable manually, in order to offer a greater level of safety. We will be able to control the climate, the lights, the operation of every single element installed on board with a simple palm device. But our boats are also characterised by the use of exclusive materials for the furnishing and finishing, starting with the marbles. How will you manage to reconcile performance, the speed target set for your boats, with the very luxurious furnishings? Marble, for example, is a heavy material; won't using it so much have a detrimental affect on the hull's displacement, with consequent effects on speeds? No, absolutely not, because we are at the cutting edge, also with regards to the fittings. Talking of marble, we have exclusive rights to a system developed by a company in Turin, that provides for the slabs, cut very thinly, to be installed on panels in carbon composite with a thickness of three millimetres. In practice, we manage to produce marble surfaces that weigh 8/9 kilos per square metre. Aren't there problems of bending? No bending problem. They can be fitted in marine environments without any problem, and their use has also been approved by the RINA.